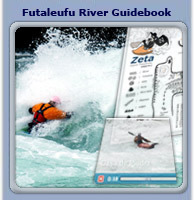 Upper Futa Límite: (Class 2 rapids, 9 km, half-day family rafting, kayaking, one-day fly fishing). From the Chile and Argentina border to the town of Futaleufu is the uppermost section of the Rio Futaleufu that we run. Put-in at the border and float through a spectacular valley. One side of the river is Argentina 's Parque Alerces and the other is the protected Chilean national huemul, a small South American deer. Take-out at the edge of the town of Futaleufu, just minutes away from our Centro Aventura Futaleufu lodge.
" Fish habitat on gentle flows of the Futaleufú Limite section"
From the Centro Aventura Futaleufu, a trail takes you to the vertical black basalt walls that line the gates of the Inferno Canyon and to the overlook of the “Zeta” and “Throne Room”. Here you may have an opportunity to see from foot, horseback, or bike: these wortld famous class V rapids. This is the most demanding, and committing section of the Futaleufu. To raft or kayak this section, one should previously run the heart of the Futa section, “Corazón” and have met the required qualifications. We put-in at the bridge on the Río Espolón and soon meet the confluence with the Río Futaleufu. At the Gates of Infierno, we enter the Infierno Canyon with several serious and continuous class 5 drops.
" This is very serious world class rafting"
Just below the canyon, the river widens with spectacular views of the Las Escalas Valley, with the river winding through it. To see this valley from the river or the trail is a trip back in time. A mountain bike ride and horseback riding trail crosses the Futaleufu on a swinging bridge and climbs out of the valley through a native forest winding back to the village of Futaleufu. A dramatic one day loop. On our special fly fishing trips we put in at the Las Escalas valley and fish this rarely fished stretch. This is something many people don't know about the Futaleufu River. After six miles of moving, gentle productive water, the river returns to its wild side and we encounter the "Zeta" and "Throne Room." These are two of the most ferocious rapids on the Futa, which even the whitewater rafters will portage.
" Your guides take care of the portage at Zeta while you walk"
Below the “Throne Room” are rarely fished, deep pools with gravel bars. Our Dream Team guides are experienced in lining the boats through these rapids and below them the rafts await you. The Futa valley trail continues all the way from town on the left side of the river to the confluence of the Azul river with the Futaleufu. A full day ride or an all day trek or hike for a fit person.
" The Throne Room is one of the most dominating Class 5 rapids on the planet"
Beneath the fly fishing polls of the Throne room we find the "Wild Mile" non stop Class 3/4 whitewater action that takes us to the confluence with the Río Azul, and ClubFuta at Campo Tres Monjas. For Fly fisherman we have horses waiting beneath the Throne for the 50 minute ride to the CondorNest ranch. The Tres Monjas mountain looms over the valley to river left. On river right, the turquoise water of the Rio Azul flows from the ice-capped glaciated peaks that form at its headwaters. An inviting white sandy beach marks the entrance of ClubFuta at Campo Tres Monjas. This river runs into the Futaleufu on river right shore next to our camp. This glacier-fed river can range between 600 to 2000 cfs, depending on rain and snowmelt in the mountains. This is a great warm-up for the Class 3/4 kayaking trips. The Azul is a great alternate river for when the Futaleufu is too high. Technical and defined, the Río Azul takes its name from the aquamarine colored water. This is great fish habitat for the native rainbow trout.
" Paddle the Azul back to the sand beach at ClubFuta."